Naval Support Activity Crane, located in Crane, IN, includes over 3,000 buildings and more than 98 square miles (64,000 acres). More than 5,000 DoD civilian and contractor personnel work at Naval Support Activity Crane. With a military population of less than 50 personnel, NSA Crane is predominately a civilian installation. 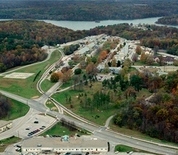 The primary command on base, Crane Division (NSWC Crane), is a shore command of the U.S. Navy. NSA Crane is under the Naval Sea Systems Command headquartered in Washington DC.